Isvind here with their debut album of freezing black metal. I used to think that this was a bootleg, but the matrix code says otherwise. You're wrong. Digipack version it was a real first press. Regular CD version it's just more common, so it yours must be an original too. Cheers! Where did you get this information from? It'd be cool to know if this is a legit version. I remember Alex Kurtagic saw my copy of this once and told me it must be a bootleg (he did the artwork of the bands self titled EP), hence why I always thought it (coupled with the fact I only ever see Digipaks being sold elsewhere). It's a 2002-2003 repress. 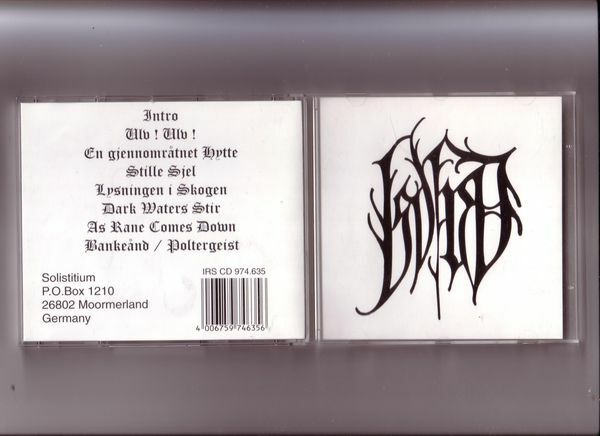 Solistitium did repressings of some of their releases in early 2000, like Helheim, Thy Grief etc.